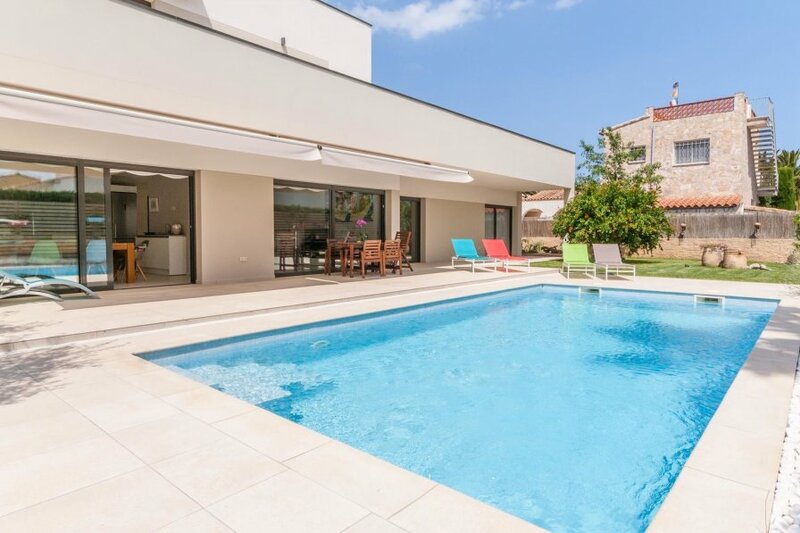 New two-floors house decorated with modern design at 400m away from the beach of Sant Pere Pescador. The house is decorated with modern furniture and fully equipped for 8 persons to make your holiday unforgettable. It has two floors, each can be an individual house equipped for 4 persons, because the entrance to each floor can be independent. Ideal for two families. The first floor has a large and spacious terrace accessible from the dining room with garden and a very nice pool area. The ground floor has direct access from all rooms to the garden. On this floor there is a with open kitchen, living room, two bedrooms and two bathrooms. The second floor has a small terrace, two bedrooms, 1 bathroom, an open kitchen with a small living room. Thanks to the quiet location in a residential area you can enjoy the serenity while the lively centre of Sant Pere Pescador is close by. Just 500 meters away is the beautiful beach that thanks to its gentle slope is also suitable for small children. Also visit the nature park Aiguamolls Emporda (4km) or the Dali museum in Figueres (17km). The city of Girona with its historic center is only 45km away.